We were pretty darn excited when we heard that a new wood-oven pizzeria was opening in our SW Minneapolis neighborhood. 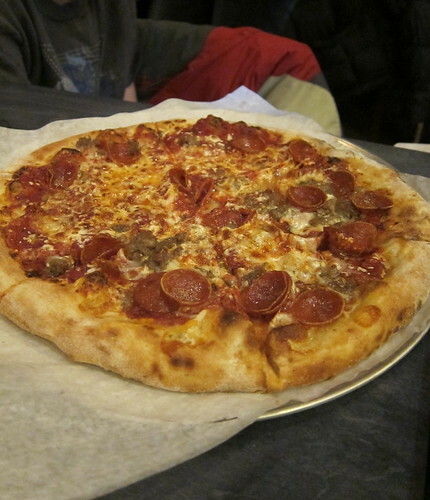 Our favorite pizza in Minneapolis to date has been Punch but even the closest location is quite a hike. The only question was, could Pizzeria Lola's pizza be as good as Punch's. We headed over to there Saturday night to find out. Apparently, half the neighborhood had also decided to try Lola out that night because there was a bit of a wait for a table, we were told 20 minutes for our party of 5. (It was actually less because the group of 5 before us got tired of waiting & left.) We were fine with the wait though, as it was toasty & warm at the bar around the pizza oven. Plus their beer & wine list offered us some good choices to enjoy while we enjoyed what a great job they did turning an old minimart into a chic little restaurant. We tried three of the pizzas. 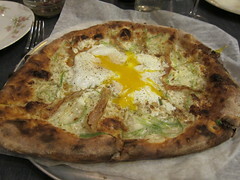 I had The Breakfast Pizza with La Quercia guanciale, pecorino, cream, green onion, pepper & a soft egg. Matt & Jenny both had the special with meatballs & ricotta (Matt said it should have been called the lasagna pizza because, it tasted just like one). The kids ordered a My Sha-Roni! 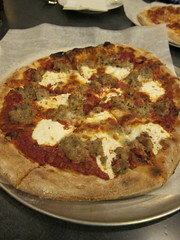 with house red sauce, mozzarella, natural-casing pepperoni & Berkshire sausage. We really appreciated the attention paid to using good quality ingredients, the difference shows through in the flavor. All the pizza were fantastic! (Though I have to say my Breakfast Pizza was the best.) The crusts were thin & slightly charred, holding up well to the toppings (which sometimes the crust at Punch doesn't). 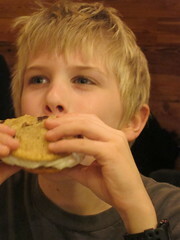 The kids had seen a few plates of chocolate chip cookie ice cream sandwiches go by our table & could barely wait for dessert. They basically inhaled them. Their mom did manage to get a bite & said the cookies were some of the best she's ever had. 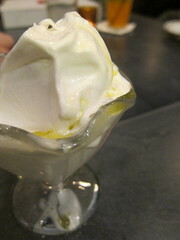 Matt & I split an soft serve vanilla ice cream topped with olive oil & fleur de sel. I am not a soft serve fan but this simple dessert won me over with the salty & sweet. It looks like Pizza Lola is definitely going to be a new favorite for us. Their pizzas are as good as (or maybe even a little better than) Punch's in our opinion. The specials, like tonights fresh fig, gorgonzola, guanciale & leeks, are interesting enough to keep us going often to try new combinations. Matt has already suggested going back twice in the last five days so, you know it's a winner. 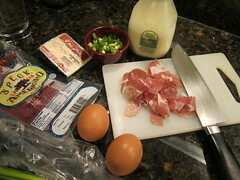 That amazing Breakfast Pizza really stuck with us so, we decided to try our hand at making it at home last night. I prefer a pizza with no red sauce so this one is right up my alley plus, with that rich, runny egg yolk, who needs sauce! Our crust is no where are good as that at Pizzeria Lola & we don't have a wood-fire oven but our version of the Breakfast Pizza still had the great taste of all the toppings. Did you know you can now get La Quercia products at Lunds?! Huge score for us Minnesotans. They don't carry guanciale (unsmoked bacon made from pig cheeks or as we like to call if "face bacon") so, we decided to try speck (dry cured, lightly smoked pork) instead. I think you could use prosciutto or even some good bacon if you wanted too. Divide the pizza in half & make into two round, thin pizza crusts (mine was about 12") on an oiled baking sheet. Brush with a generous amount of heavy cream. 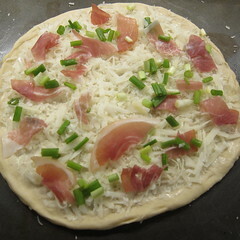 Top with the grated cheese then add onions & speck. We left a little empty circle in the center of each pizza for the egg. Place in the oven & bake for 10 minutes. Remove from the oven & crack an egg into the center of each pizza (We found it easiest to crack the egg into a bowl & then pour onto the pizza). Return the pizzas to the oven & bake for another 5 - 8 minutes until the egg white is cooked but the egg is still soft. Season with freshly ground pepper. Oh my gosh--that looks incredible! I can just taste the runny yolk with everything else, all runny and rich and gooood. Maybe an experiment for the weekend! I was there Sat night too, but went late to avoid the rush - we must have just missed you! We loved the Sweet Italian, which was obviously named after me :-). Super excited to have this place practically in my front yard! Pizza for breakfast sounds yum!! A very cool pizza. I know I would love it. I had to laugh about the kids rushing to get to dessert. My kids do the same. I wish vegetables had the same affect on them. I'm a sucker for oozing egg yolk! I can just imagine the yolk oozing out while eating that pizza. What a great post. Love that you went home and did a home recreation of what you had. Such a fantastic idea!!! Yours looks just like the original and I'll bet it tastes just as good too. You're making me hungry. Those ice cream sandwiches look pretty amazing too. Looks delish! 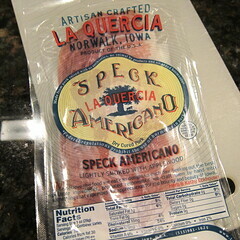 We love speck and can never find it, so enjoy! Breakfast pizza... I think I'm in love! My husband and I have been to Pizzeria Lola a couple of times already and are IN LOVE!! The crust is perfection. 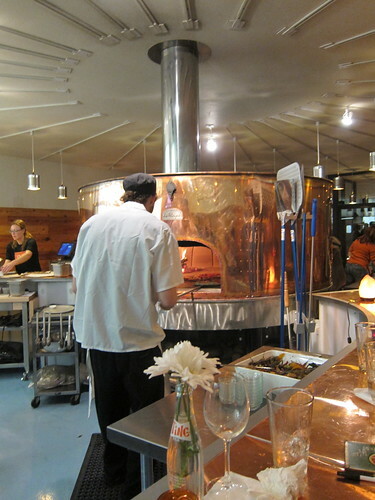 Did you know that Pizzeria Lola has plans to offer up the residual heat from their ovens for bread baking? It's free!! On their facebook page they say that they'll "keep us posted". Laura - OMG that would be awesome! 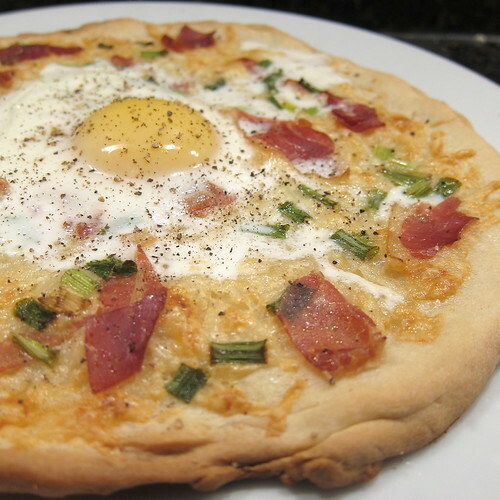 i think breakfast pizzas should be the next big thing--they're absolutely awesome. good stuff, kat! Both yours and Lola's look wonderful. I love a breakfast pizza! The pizza sure is very interesting to try! I haven't eaten a pizza with a sunny side up egg on. Seems very good to me! I've made breakfast pizza several time and we loved it. But mine was not as pretty as your is! !